Acqua Di Parma Blu Mediterraneo Italian Resort Pumice Body Scrub has an effective complete exfoliating action and donates a skin free from all impurities that looks and feels renewed, bright, velvety and visibly toned. 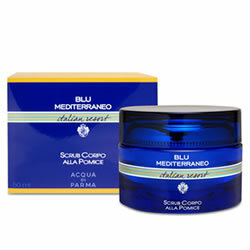 Acqua Di Parma Blu Mediterraneo Italian Resort Pumice Body Scrub wraps your body in the caress of Mediterranean sand and salt. Acqua Di Parma Blu Mediterraneo Italian Resort Pumice Body Scrub is bright and golden as the rays of the sun, gliding over your skin, caressing it with the vital, regenerating touch of sand and salt. Acqua Di Parma Blu Mediterraneo Italian Resort Pumice Body Scrub uses Mediterranean Oxygenating Complex to purify, pxygenate, nourish and protect the skin and granules of different sizes of volcanic pumice, marine salts and citrus peel for an invigorating, gentle and complete exfoliation.